A lifestance of personal fulfilment without belief in the supernatural. Dignity and value of the human individual in an unknown universe. Positive agnosticism and or atheism. A movement that defends and promotes secularism. A positive position evolved from freethinker positions. * Place mouse slowly over coloured words for additional explanations. 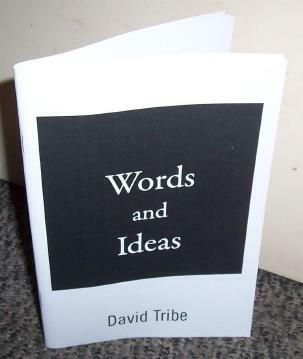 We have published a small book to give a more complete answer as to what we see is Humanism, click Articles to the left. Humanism is a rational philosophy informed by science, inspired by art, and motivated by compassion. Affirming the dignity of each human being, it supports the maximization of individual liberty and opportunity consonant with social and planetary responsibility. It advocates the extension of participatory democracy and the expansion of the open society, standing for human rights and social justice. Free of supenaturalism, it recognizes human beings as a part of nature and holds that values - be they religious, ethical, social or political - have their source in human nature, experience, and culture. Humanism thus derives the goals of life from human need and interest rather from scriptures, theological or ideological abstraction, and asserts that humanity must take responsibility for its own destiny. A special declaration about Humanism was adopted by the IHEU in 2002. For more on what we think Humanism is, click on the Student Resources link at the left. To encourage respect for the universal human rights of men and women free from discrimination on the basis of race, class, disability, gender, age, nationality or sexual orientation. participate in advancing and evolving secular philosophy. Humanists advocate the separation of church and state. We support John Goldbaum's archived TV advertisements campaigning that religion be kept out of politics. Click here for more about this area of concern. 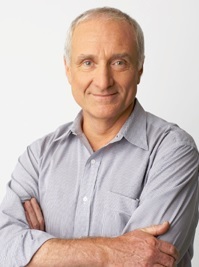 Humanist of the Year 1993, Member of the Order of Australia 1988, a talented actor, science journalist and broadcaster, Robyn, presents Radio National's Science Show, Ockham's Razor and In Conversation. Robyn has written more than 10 books and received an Honorary Doctorate in Science from the Universities of Sydney, Macquarie and Deakin. Mother, bilingual sociologist, peace activist. Dorothy is also an environmentalist, a feminist and committed to the cause of reconciliation with indigenous Australia. As founder of the Ethnic Communities Council Dorothy was, and is still, a vital influence in the ethnic communities. More about our views and philosophies. Includes link to our Euthansia Report, still remarkably current, published in 1973. "Australian Humanist of the Year"
Since 1983 Australian Humanists have bestowed the award of Humanist of the Year on a person who has made an outstanding contribution to public life, consistent with Humanist ideals and values. The selection is coordinated by Australian Humanists (Council of Australian Humanist Societes - CAHS), who call for nominations from State Humanist Societies. Involved in various lobbying activities - a current one is to challenge the demand of Fred Nile to close down the public school ethics classes. We encourage people to write "No Religion" in the last few Censuses if that is their real position. Archive of our how you should answer the Census' Q10 page. Over time, since the 60s, we were responsible for the formation of the Council fo Civil Liberties; the Preterm foundation; the Secular Defence Society; the Voluntary Euthanasia Society (now Dying with Dignity); Alternative Publishing Co-operation (APCOL); the Penal Reform Association; the Abortion Law Repeal Association; the Cancer Information and Support Society; the Gay Counselling Service; and Toleration: A Coalition Against Fanaticism; the Australian Institute of Philosophy for Children and Amnesty International. The existence of secular marriage celebrants today is a result of our lobbying efforts in the 60s and early 70s. The monthly HuVAT meeting program is also a social get togethers. With the Australian Humanists cAHs (Council of Australian Humanist Societies). 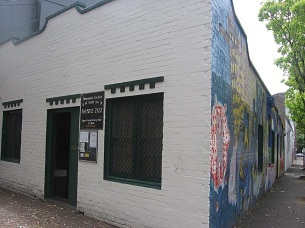 The Humanist Society of Queensland (Brisbane). 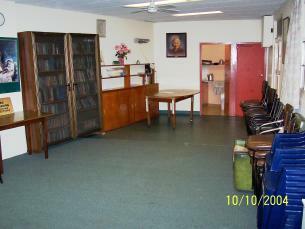 The Humanist Society of Victoria Inc. (Melbourne). The Humanist Society of South Australia Inc. (Adelaide). The Humanist Society of Western Australia (Perth). Council of Democratic and Secular Humanism (CODESH) . We support by donation the IHEU project to gain liberty for the Dalits - the "untouchables" of India. Don't want meaningless religious gobbledegook for celebrations of important personal events but still want a celebration that is appropriate? Then Humanist Societies are THE organisations to get in touch with! Did you know that the civil marriage celebrants system was the results of our lobbying efforts in the late 60s to early 70s? Naming, Marriage & Funeral celebrant information (suits NSW residents only). If you feel you can sign agreement to the objectives (click Home tab), why not consider joining? Contact - You get our newsletters, know when meetings occur. Contribution - there's lots to do to promote the secular cause. We have a structure to facilite you doing things. Some things to do include training for and participating in undertaking teaching ethics classes in your local public school; help produce programs for broadcasting on public radio; help organise meetings; draft submissions to government inquiries; write and review articles for our newsletter or these web pages; facilitate socials - only one active person can make a big difference!, etc. Fees are $35 single, $45 double and $20 concession. 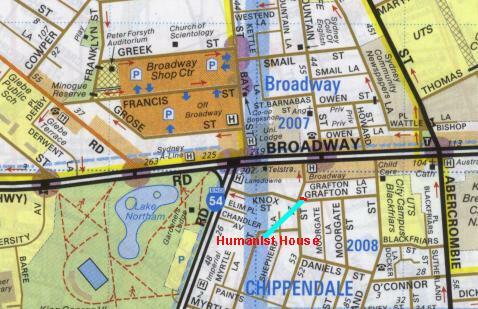 Street address: Humanist House 10 Shepherd St Chippendale 2008. Please note that the email links only work if you run an email program on your computer. It does not work if you use a webmail account. If so please phone us. We cannot afford to baldly place email addresses here to protect ourselves from spammers. Humanist Society of Queensland's Facebook site. Location: 10 Shepherd St Chippendale this is one street south of Broadway near the Broadway shopping complex, near Sydney U and the UTS, near bus stops, better parking after 6 pm, phone on premises. Preference is given to non-profit associations whose objectives are consistent with ours.